LAUSD is poised to join a big push to get more per-pupil money from the state. But where is California ranked, really? We’re No. 46! No, we’re 41! Or is it 37? How California ranks on per-pupil spending is a numbers game that most everyone believes the state is losing compared to the rest of the country. LA Unified school board members will decide on Tuesday if they will join the local teachers union in a call to Sacramento to double education funding to $20,000 per student by 2020 and then to hit $25,000 by 2022. Both the school board and UTLA have cited the figure that California ranks 46th in the nation when it comes to per-pupil spending. But there are a variety of rankings used to measure spending, and that one is outdated. The resolution itself, authored by school board member Kelly Gonez, doesn’t cite a data source. When asked to provide the source, Megan Vandenbos, Gonez’s chief of staff, sent a link to Education Week’s 2017 Quality Counts report that ranks states on school spending, student achievement, and its “chance for success” index. EdWeek’s ranking uses data from the National Center for Education Statistics and adjusts per-pupil funding for cost-of-living. The figures are for 2014 (the resolution says 2017). In 2014, California spent $8,694 per pupil and ranked 46th, while New York, spent $18,191 per pupil and ranked third in the nation. First in the nation was Vermont at $19,654. More recent figures come from the nonpartisan California Budget & Policy Center in a report released in January on 2015-16 spending, but even that report gives two different rankings. In terms of state spending per K-12 student, the report gives California a rank of 41st. That’s $10,291 per student, adjusting for cost-of-living. But when ranking education spending as a share of the state’s economy, California came in 37th, according to the report. Gonez’s resolution also includes this ranking. The report also shows that per-pupil spending in California has increased since 2012-13 (when it ranked 50th in the nation) because of the state income tax increase called Prop. 30, which California voters extended last fall. Prop. 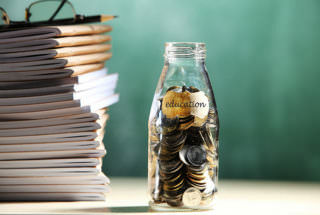 30 helped increase K-12 education funding that had been drastically reduced amid the Recession. “However, the latest figures illustrate that a sizable gap between California spending per K-12 student and the U.S. remains,” the report states. The national average was $12,252 per student in 2015-16. No matter the ranking, California is the world’s sixth-largest economy with a Gross Domestic Product of $2.4 trillion. The state also has the highest rate of students in poverty in the nation and faces a shortage of skilled workers by 2025. Gonez’s resolution, which also has the support of board members George McKenna and Nick Melvoin, points out that well-funded states like New York and Vermont consistently have higher student achievement results than California students on standardized assessments like the National Assessment of Educational Progress. But California wasn’t always near the bottom. In the 1970s, California ranked in the top 10 nationwide in per-pupil education spending. • Read more: Pulitzer Prize-winning reporter Rob Kuznia’s report on education funding in California compared to other states. LA Unified is the largest school district in the state and the second-largest in the country. If its school board members unite in spending money to advocate in Sacramento and to fund a targeted media campaign, the weight of their voice would likely be heard. The district is looking for a state legislator to sponsor a bill. Eric Premack, executive director of the Charter Schools Development Center, who used to work in the state Legislative Analyst’s office on education funding issues, said there is no perfect methodology to determine exactly where California ranks. Alex Caputo-Pearl, president of United Teachers Los Angeles, has also used the 46th ranking figure in calling for more state funding. He announced the union’s $20,000 per student by 2020 campaign during his State of the Union speech this summer. The school district is in contract negotiations with its labor groups, and UTLA asked the school board to join its call for more state funding as part of its bargaining proposal. Lower student to counselor ratios.